At the time of writing, the GLO Premier Leauge 2011-2012 in Ghana has reached its seventh round of football. Here are some observations from the six first rounds. * Things are as expected at Aduana Stars FC. The club is struggling for goals but has one of the meanest defences in the league, centered around Johnson Adomah (born 05.06.1985) and Emmanuel Akuoko. Right-back Godfred Saka (born 02.11.1988) has been on fire lately and the set-piece expert already has three league goals to his name. Richard Arhin (born 09.11.1991), signed from the Red Bull Academy befBeore the season, has been ever present up front but has still not scored a goal. Bernard Don-Bortey (born 22.09.1982), widely regarded as the most creative player at the club, is unsettled and has only featured once so far this season. * Asante Kotoko FC has the most exciting attacking duo in the league. Nathaniel Asamoah (born 22.02.1990) and the mercurial Ivorian striker Ahmed Touré (born 17.07.1987) has scored three and four goals respectively. Attacking midfielder Augustine Okrah (born 18.09.1993), who impressed in pre-season, has somewhat surprisingly yet to make his league debut but has been on the bench once. Veteran goalkeeper Abdoulaye Soulama (born 29.11.1974) from Burkina Faso has been in great form and has been ever present so far. Teenage left-back Abdul Rahman Baba is one of the most hyped players in the league at the moment. Baba has been impressive in the four matches he has featured in and the modern-style attacking player has already been named in the squad of the Ghana U-20 national football team. Apparently, Baba is already on the radar of European scouts. Baba is a former member of the Ghana U-17 national football team and was signed from Dreams FC before the current season. * AshantiGold SC has been somewhat dissapointing so far and the club desperately needs a goalscorer. Yakubu Mohammed (born 26.07.1990), last season’s top scorer, has only one goal to his name so far. Ivorian attacker Didier Florent Guibihi Koré (born 17.04.1989) has yet to score despite being ever present so far. At the moment, the most interesting players at the club are playmaker Aaron Amoah (born 07.07.1993), defensive midfielder Malik Akowuah (born 07.04.1989) and right-back Henri Traoré from Burkina Faso. * Newly promoted Bechem United FC are rock bottom with only one point. Their defensive record is horrible despite interesting newcomers such as goalkeeper George Arthur (born 16.03.1987) and right-back Godfred Ofosu (born 21.01.1989) – both signed from Asante Kotoko FC. I’m expecting more from the experienced strikeforce of Richard Addai (born 27.07.1986), formerly of Aduana Stars FC, Eric Fordjour (born 07.08.1988), formerly of AshantiGold SC, and Peter Ofori Quaye (born 21.03.1980), with about 20 matches for the Ghana national football team. I think the club could use a midfield general, such as the already mentioned Malik Akowuah. * I have a good feeling about central defender John Afrifa (born 03.12.1993) and right-back Prince Ahenkan Adjei of Berekum Arsenal FC. Both players are rookies in the GLO Premier League and they have made impressive starts to their careers. * A few days ago, Hans van der Pluym, the head coach of Berekum Chelsea FC, stated that there are too many rugged defenders in the GLO Premier League and that Ghana should develop more ball playing defenders. Personally, I totally agree with van der Pluym. From my point of view, one of the best ball playing defenders in Ghana is youngster Ahmed Adams of Berekum Chelsea FC. Berekum Chelsea FC has won their two last matches and I think they will become stronger as the season grows older. Emmanuel Clottey (born 30.08.1987) has found his scoring boots with three goals in the last two matches. It’s also interesting to see that Ernest Sowah (born 31.03.1988) claimed the number one shirt when he returned from national team duties despite good performances from Collins Addo (born 24.04.1989). From now on, it’s no question who is the first choice at the club. I’m expecting a lot more from newly signed midfielders Solomon Asante (born 06.03.1987), Gladson Awako (born 31.12.1990) and winger Nurudeen Ali (born 16.05.1991). All players have had a rather quiet start to the season. It’s also interesting to see that Kweku Andoh (born 16.10.1990), who was a big star at Heart of Lions FC, has failed to break into the first team. Coach van der Pluym seems to be preferring Eric Agyemang (right-back), Alfred Arthur (left-back) and central defenders Adams and Edward Kpodo (born 14.01.1990). * Goalkeeper Foli Adade (born 10.12.1992) of Ebusua Dwarfs has been in impressive form this season, conceding only two goals in six matches. Adade is arguably the most promising teenage goalkeeper in Ghana. He is strongly built, very athletic, but not the tallest. Adade is an excellent shot stopper and also confident with crosses. * Benjamin Fadi of Heart of Lions FC seems like an interesting striker. Fadi is about to force his way into the first eleven and is apparently a young, lively striker. Fadi scored his first ever league goal on 09.11.2011 against Aduana Stars FC. 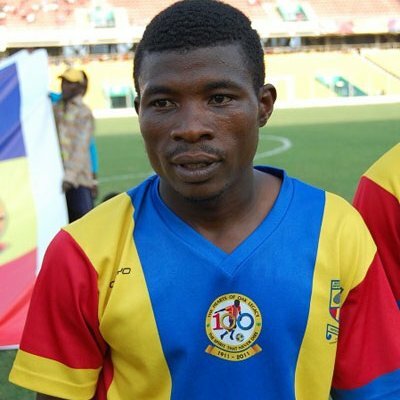 * Thomas Arnold Abbey of Hearts of Oak SC has been one of the revelations of the new season. Abbey, apparently 18 years old, was signed from Windy Professionals FC during the summer and has already been named in the squad of the Ghana U-20 national football team. Abubakar Moro(born 07.08.1991), the central midfielder, has also been in great form. Moro is very important for the defensive play of the team with his energetic style, hard work, important tackles and constructive passes. The picture is of Moro and is taken from the new homepage of Hearts of Oak SC: http://www.accraheartsofoak.com/site/home. The central defensive pair of Kofi Agyare (born 19.02.1982) and Godwin Osei Bonsu (born 03.03.1989) seems very solid and if Douglas Nkrumah (born 28.11.1986) and Mahatma Osumanu Otoo (born 06.02.1992) manages to score regulary, I think Hearts of Oak SC could have a good season. * What impresses me with Liberty Professionals FC is the seemingly endless flow of talent the club manages to produce, as well as their massive squad with often three players competing for the same position. Liberty uses a rotation system and it is only captain Michael Helegbe (born 15.09.1985), wonderboy Zuberu Fuseini, playmaker Issah Yakubu and holding midfielder / sweeper Kingsley Nteng that has been ever present so far this season. Isaac Sackey, a lanky central midfielder, and central defender Alfred Nelson (born 18.08.1992) are two players to watch. * How long can Medeama SC hold on to attacking midfieler Jacob Asiedu Appau (born 12.10.1994)? The creative midfielder is already on the radar of European clubs and is currently part of the Ghana U-20 national football team. * It’s all about Emmanuel Baffour (born 02.04.1989) at New Edubiase United FC. Baffour, the hard-working, intelligent striker, has scored an amazing tally of eight goals in six matches. Local experts think Baffour deserves a chance at the Ghana national football team. Captain Abubakari Mumuni (born 17.05.1993) is getting more and more attention and this brilliant midfielder, the Most Valuable Player of last season, will most likely get a contract with an European club during 2012. * Tema Youth FC is currently best of the newly promoted teams. Teenage playmaker Moses Odjer and captain Bernard Akuffo (born 20.12.1986) are arguably the two players that has impressed the most so far this season. * Central midfielder Seidu Salifu (born 02.08.1990) of Wa All Stars FC has gotten some rave reviews this season. * Wassaman United FC looks poor which is somewhat surprising when you consider the many experienced and interesting players that has been brought to the club, including midfielder Prince Antwi (born 17.06.1986), winger Abdul Bashiru (born 17.04.1992), left-back Emmanuel Eyison (born 02.07.1989), talented midfielder Razak Kassim, midfielder Issah Salihu (born 28.09.1983), midfielder Kweku Essien (born 12.12.1984) and midfielder Yufa Zugah (born 01.08.1989). I think Wassaman United FC has made the common mistake of bringing in too many new players at one time. I also have a feeling that the club is somewhat unbalanced, too many midfielders and few strikers with a nose for goals. However, I think Wassaman United FC will become better when the new players settle into the team. Watch out for Razak Kassim!